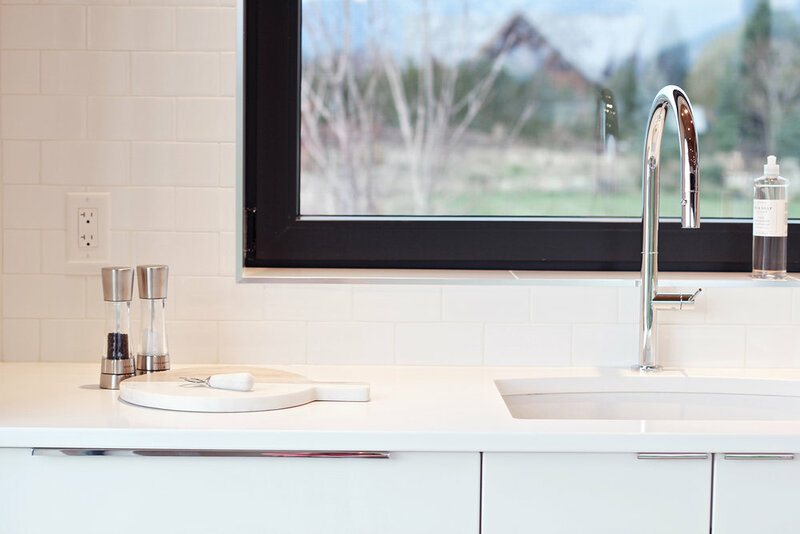 This modern kitchen design was provided for a private residence in West Kelowna. 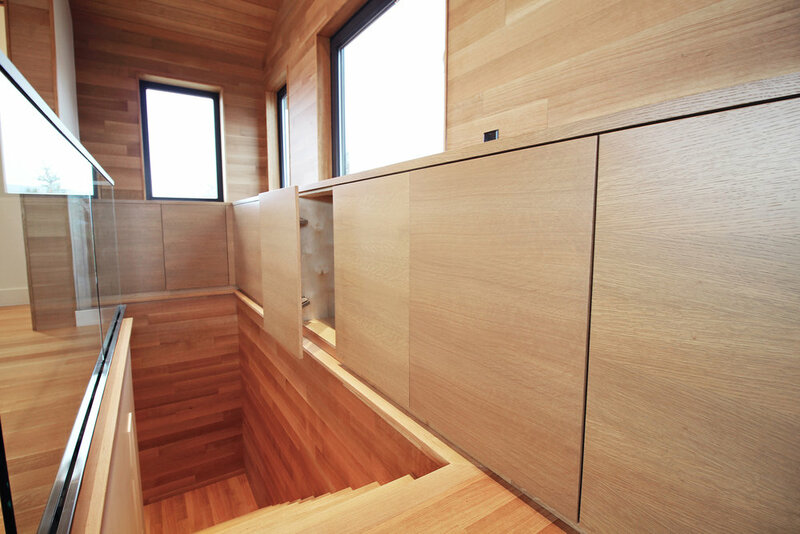 The house was narrow and the horizontal grain direction of the cabinetry accented the linear design of this house. Modern Melamine does a great job of mimicking the look of real wood and often includes a texture that feels like real wood. Under Cabinet lighting is a great accent for floating vanity designs. This Corner open shelf cabinet included a custom shelf frame to match the adjacent doors. 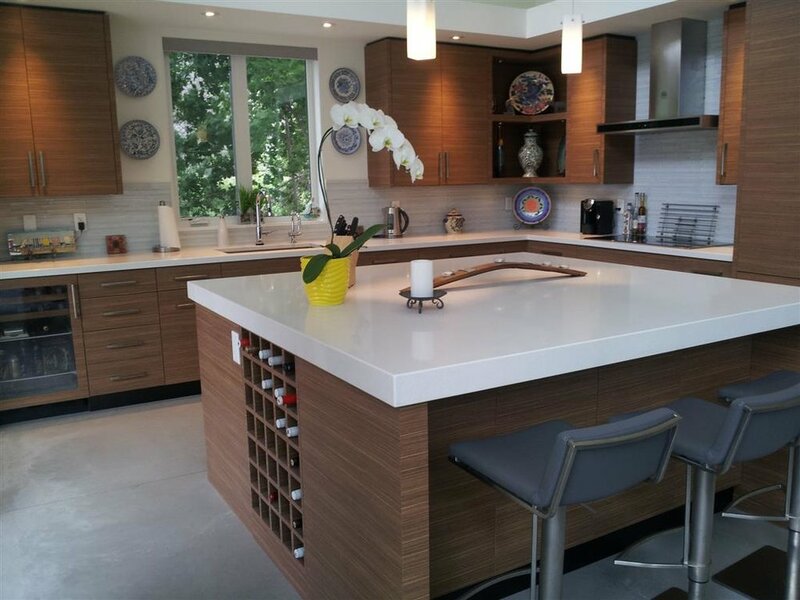 The horizontal grain direction of the melamine in this kitchen minimizes the verticality of the tall upper cabinets. Built in island wine storage. This is the Okanagan Valley after all. The modern look of this kitchen is completed with a modern appliance package. 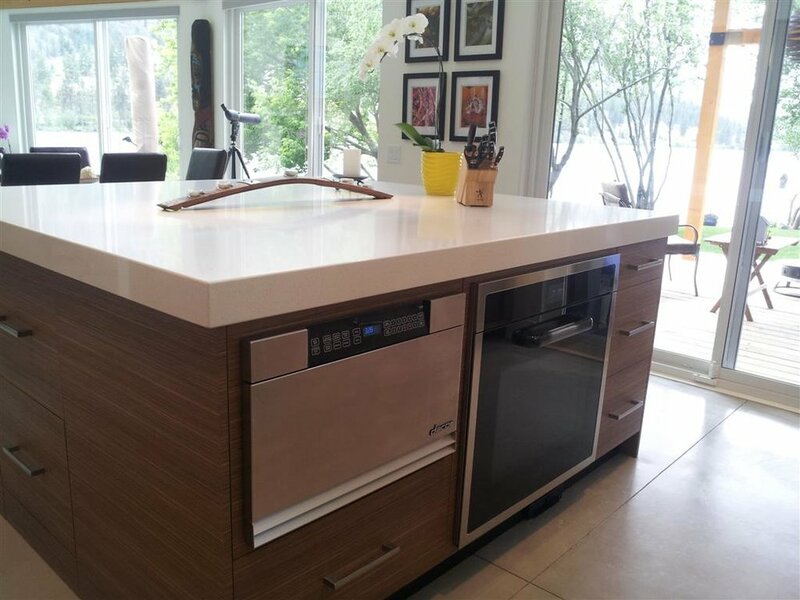 The thick island end columns extend back beyond the cabinetry, supporting the extra thick countertop and providing definition for the island seating. Today's melamine colours offer the look of real exotic wood species without the high cost and often include texturing that mimics the feel of real wood. These High Gloss Cabinets use Aventos lift up door hardware for vertical openings. The Glass Door at the top is activated with a touch release mechanism. A wall hung floating vanity in Zambukka Melamine. This tub wasn't supplied by Ellis Creek, but we sure do like it a lot. Achieve a high end modern design on a budget with new textured melamine surfaces from Ellis Creek. A mini kitchen with white high gloss finishes and Quarter Sawn White Oak shelving. Quarter Sawn white Oak Cabinets with custom lateral sliding doors. 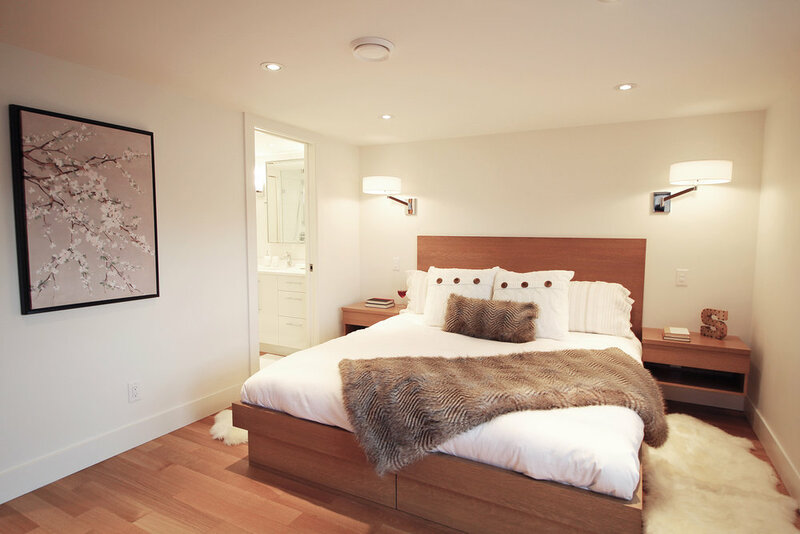 Custom Quarter Sawn White Oak platform beds with touch release drawer storage. 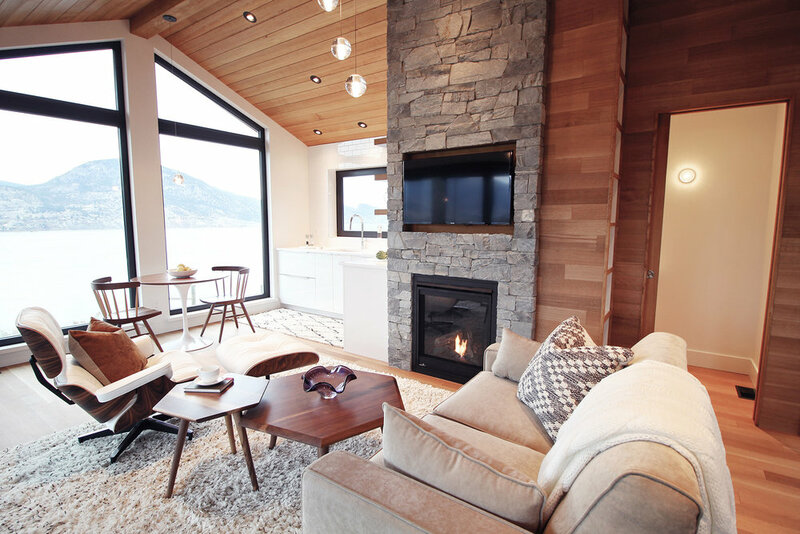 A modern design that maximizes the storage potential in a particularly small space. Paint + Wood = Beautiful!